Nvidia Working on Switchable GPU Tech for Laptops? "Apple's share of the U.S. laptop market seems to be taking off with even more steam than the Mac's marketshare increase overall, according to a new report by TMO. While news of Apple's increased marketshare in the United States to a recent high of 4.8 percent just came out last week, it appears as if sales of Apple's new Intel-based laptops, the MacBook and MacBook Pro, are seeing very strong retail sales and growth amongst laptop buyers." "The number of Americans who work during their vacations has nearly doubled in the last decade, with the laptop computer replacing the cellular phone as the most useful tool for working on holiday. "Some 43 percent of office workers said they work on vacation, compared with 23 percent in a survey taken in 1995, said the poll conducted for Grand Rapids, Michigan-based Steelcase Inc., a designer and maker of office furniture." "More problems have been spotted with Apple's super soaraway MacBook Pro. Already bedevilled with claims that it stains too fast and its batteries swell up, the poor MacBook Pro apparently can't be charged with some aircraft or car sockets. "According to MacFixIt, the issue appears to be excessive power draw, as units can be charged from the inverters while powered off, but have issues about charging when turned on. "A MacBook Pro draws a staggering 85W of power, while most airline power inverters supply 75W or less." "Apple's new MacBook is easily the best laptop for the money currently being sold. It packs in spectacular power and some of the most advanced features available. That said, there's always room to accessorize. Being longtime Mac users and new MacBook owners, we've rounded up our top 10 products to help you pimp your MacBook. "A lot has happened since the last update to my ongoing MacBook saga. I'll try to make this as brief as possible, but it's a long story . . . and still isn't over. "So, I called Apple and set up the return. They received my MacBook on July 7th. On Tuesday, July 18th, my online repair status still said 'Parts on order.' Great. Nearly two weeks and my MacBook is just sitting around waiting on parts. I called Apple Support to see what was up. The woman said she was very sorry and that she was putting me on some sort of priority list where they would locate the parts within 48 hours or they would discuss 'other options' with me if they couldn't find them. She basically said that because of the large amount of MacBook repairs going on right now that parts were scarce. "On Thursday, July 20th, my repair status jumped to 'Repair completed' and then 'Pending shipment.' Awesome. All of my 'unacceptable' comments finally worked. Then this morning at my door, the FedEx man cheerily handed me my MacBook, which was shipped via FedEx Air . . . I first looked at a piece of paper with the service details on it. I'm not sure what all they replaced, but it sure looks like a lot. I can make out words like fan, heatsink, 2.0 GHz, and (strangely) camera. "But as I triumphantly opened the lid of the MacBook, I heard something I had never heard before. Not a moo this time, but a loud, high-pitched squeak...."
"In the computer business, notebooks are where the money is. What used to be a secondary sibling to the desktop is now increasingly the only computer anyone wants or needs. That has PC makers adding top-shelf features designed to attract the attention of power users, serious gamers, and others who need a notebook that is anything but secondary. Often they're called 'desktop replacements' because they are large enough to include full-size keyboards and have large 17-inch screens that for the most part look gorgeous." Charles Moore says: Indeed they do. I work on one every day. I guess I was way ahead of the curve for once, making the switch from desktop Macs to laptops as my main production workhorses back in 1996, since which I've been advocating them as "the logical Mac" for most users to anyone willing to listen. "Dell's December 2005 battery recall followed the recording of dozens of incidents over a two-year period of overheating notebooks, many resulting in melted or burned computers, it has been alleged this week as the company continues to investigate the case of a laptop that burst into flames in Japan. "The incidents are detailed in a series of documents leaked to US trade paper CRN by a source said to be close to the computer vendor. According to the paper, the records list examples of machines with melted or charred casings. Signs of overheating were not always visible near the battery. However, many appear in places associated with high temperatures during the operation of any laptop. "CRN's latest report comes shortly after another which highlighted a second case of computer combustion, this time concerning a Dell notebook which caught fire inside a building in Novell's Provo, Utah facility. The building was evacuated. Novell later said the offending laptop had been fitted with a battery supplied not by Dell but purchased from a third party." "Nvidia is working on technology that would allow notebooks equipped with an integrated GPU and a dedicated graphics chip to flip between the two engines at will. Even though the system doesn't appear to allow the two GPUs to render co-operatively, it's claimed Nvidia will dub the technology 'SLI Power'. "According to a Laptop Logic report, the technology is designed to provide graphics horsepower when its needed, and more basic, battery-friendly rendering at other times." Link: Nvidia Working on Switchable GPU Tech for Laptops? "If your MacBook is exhibiting discoloration on the top case after some use, please contact AppleCare for service." "If your 15-inch MacBook Pro emits a high-pitched buzzing sound, please contact AppleCare for service." PR: The AVA Softpads are specifically designed to protect iBooks, PowerBooks, MacBooks, and MacBook Pros from scratching. Made of the highest quality microfiber, they add a thin layer of protection to the wrist rest area of your notebook, saving it from daily wear & tear & scratches from your wristwatch, etc. The soft, smooth pads are designed to be removable & washable. The revolutionary adhesive allows you to reuse your Softpads again & again to extend the good looks of your notebook with no residue. PR: Install any 2.5" SATA hard drive, or upgrade the drive in your MacBook, MacBook Pro, or Mac mini Intel and use your old drive in this case! The OWC Mercury On-The-Go FireWire 800/USB 2.0 Portable Kit packs an incredible punch into a 3" W x 5.5" L x 1" H 11 ounce package! If you're looking for one of the most compatible mass storage solutions made, look no further! 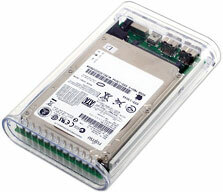 The OWC Mercury On-The-Go drive is all you'll need! Packing a one-two punch of super fast FireWire 800 and USB 2.0, the OWC Mercury On-The-Go has what it takes to truly work cross platform. The OWC Mercury On-The-Go features the latest in performance with an Oxford 924 combination FireWire and USB chipset creating one perfectly integrated storage solution. The OWC Mercury On-The-Go keeps everything running silent while still keeping your drive cool with a built in aluminum heatsink underneath the hard drive, and passthrough cooling vents on the top of the case. The On-The-Go External FireWire Case kit is ready to accept your own 2.5" SATA Hard Drive! Why not upgrade your PowerBook's internal drive and put your old drive in an external case? This solution will give you an excellent transportable storage device, or a backup option that you may have not had! USB 2.0 / 1.1 Backwards compatible 5 pin mini "A" port. Macintosh: Macintosh with FireWire Interface and OS 8.6 and above. PC: PC with FireWire interface and Windows 98 or other OS with FireWire Support. Macintosh: Macintosh with USB interface, either built in or via 3rd party card. USB 2.0 drivers required for use with Mac OS X, USB 2.0 not supported on any other Macintosh OS. Mac OS 8.6 and above for use with USB 1.1. USB 2.0 is fully backwards compatible with USB 1.1. PC: PC with USB interface and Windows 98 or other OS with USB support. USB 2.0 drivers required for USB 2.0 use. Check with your OS manufacturer for the availability of USB 2.0 drivers for your system, and if your USB card supports USB 2.0. USB 2.0 is fully backwards compatible with USB 1.1. Bus Power via USB on all models with USB 2.0 port factory stock, or any system via add-on USB 1.1 or USB 2.0 PCI Card. Use of included AC Adapter is optional; units are designed for Bus Power and do not require the use of external power source. PR: SecuriKey, a leading provider of laptop and computer information security solutions for data protection and user authentication, announced today the launch of its new Multiuser Edition. SecuriKey Professional Multiuser locks down laptops in groups large and small. Multiuser fits nicely between SecuriKey's popular single user Professional product and the larger, server-based Enterprise Edition. Multi- User is based on SecuriKey's award winning technology, further expanding user- friendly solutions now for smaller work groups. Speed of deployment, strength of protection, ease of use and excellent cost/benefit ratios are the hallmarks of this addition to the SecuriKey technology family. Supported platforms include Windows XP, Windows 2000 and Windows 2003 Server and both PowerPC and Intel-based Macs. Windows Vista support is being developed for 2007. "Protecting mobile data has become the highest priority for aware organizations today," said Bennett Griffin, CEO and founder of SecuriKey. "SecuriKey Professional Multiuser solves the problem with terrific capabilities in a compact, simple to deploy package." 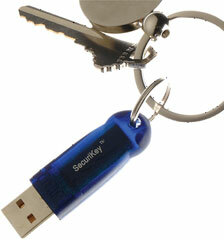 SecuriKey is an encryption-based USB security key system, combining a password and an ignition key for the computer. Intuitive SecuriKey requires almost no user training. SecuriKey Professional Multiuser provides meaningful administrative control without the IT complexities of back end infrastructure. SecuriKey Professional Multiuser is currently shipping worldwide. To purchase any of the SecuriKey products, call SecuriKey at +1-800-986-6578 or visit the SecuriKey website.